Happy Memorial Day! I hope today finds you spending time with friends and/or family, remembering the men and women who've given the ultimate sacrifice for the great, ol' US of A.
I'm actually writing this on Saturday because I'm crossing my fingers that lil' punkin will be healthy enough to leave this house and head on over to the in-laws for Memorial Day. We've been cooped up in this darn house for days (and days, and days), but on Monday (well, today, if you're reading this on Memorial Day) we're combining Memorial Day with my brother-in-law's college graduation party. We're just right proud that he done gone off and got hisself all learned up. 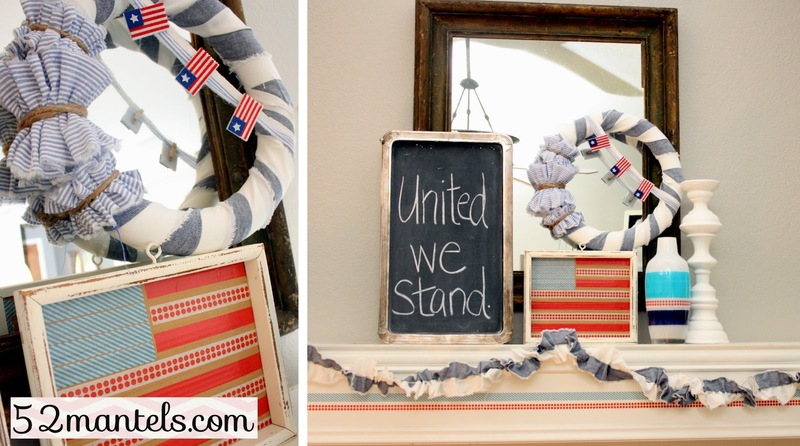 The tutorial for the American flag Washi Tape art can be found here. 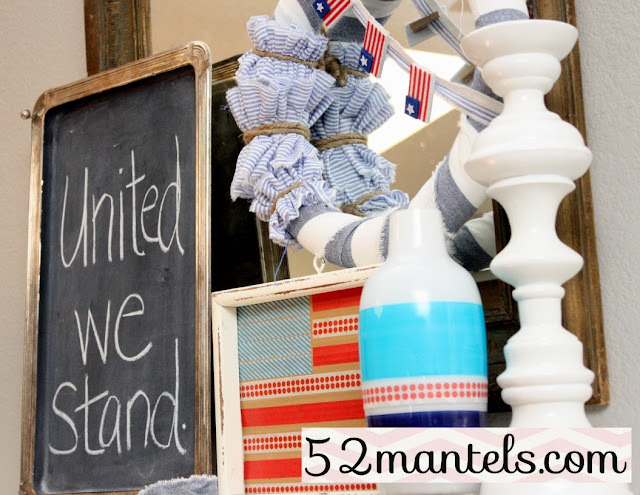 And, did you notice I even put Washi Tape on my mantel?? And, my blue/white vase? I told you I've Washi-ed the heck out of things lately. One of the awesome things about Washi Tape is that it isn't very sticky, so it peels right off without leaving a residue! My wreath tutorial can be found here. And, the tutorial includes 3 variations so I can switch it up all Summer long. No need to store a bunch of wreaths, now is there? 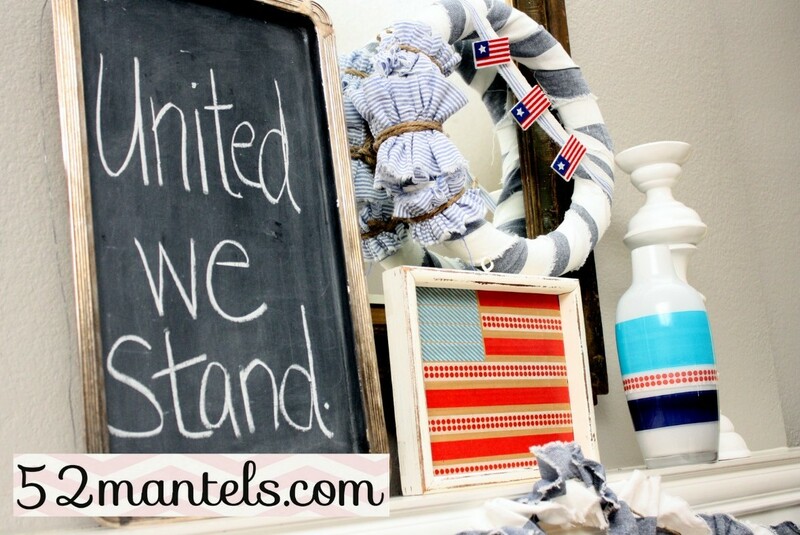 I hope you have (had, or are having) a wonderful Memorial Day!! And, because it's also my brother-in-law's big day, Hotty Toddy. Another great mantel Emily! I love washi tape too! I so hope that you are at that party today! Have fun! Hi Emily, This is a super nice blog.. I'm new to your blog, I am hoping to join your parties, too. My sis, (renae) simple sequins invited me here when she found you. I am interested to see more mantle decor. Cute ideas. Great mantel...what's the blackboard? Cookie sheet sprayed with blackboard paint? Thank you for remembering our military men and women in such a beautiful way. Heart felt thanks to all who served and are serving to keep America Free. Also thank you to your families. I love the uniqueness of this. It's not the standard bright red white blue! The wreath is my favorite part, I'll have to go check out the link on it. 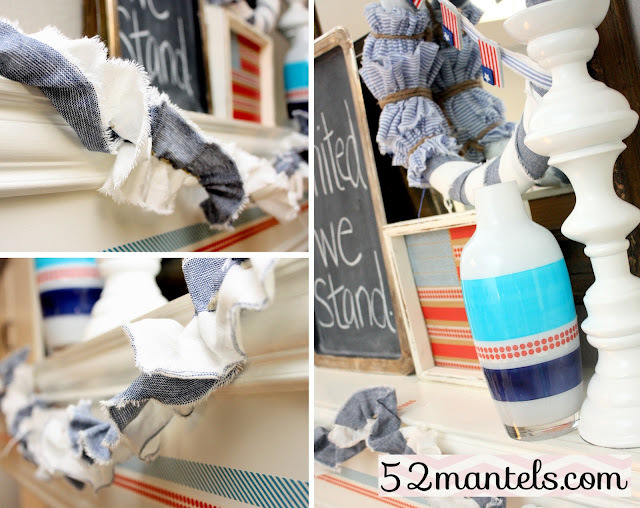 Also thought it was clever to add washi stripes to your mantel. I need to get me some of that tape. Looks like a lot of fun.